Leather shoes with front tassels, popular with the skinhead brigade. This was a fashion that only appealed to the under 20s and not the older age group of the seventies. 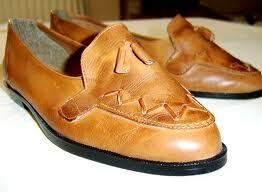 Loafers made you look cool and sound even cooler especially if you fitted Blakeys to your shoes and most people did. You wore loafers together with your Ben Sherman, Sta-press trousers and Crombie (1972). The best way to describe Loafers would probably be to say they were slip on shoes normally for the guys with a little style. They had no laces, and they just gripped the feet for a real comfortable fit, and more important they were so easy to kick off, or put on in the morning. Perfect for the lazy teenagers of which I was one. The Loafers could look smart for school or work, or really cool for going out in the evenings and hanging out with your friends on the street corner or youth club. The shoes covered such a range, that it is hard to believe that they were all just under the one umbrella name of Loafers. You could buy a version without the tassels – called Royals and these were also popular with the shaven headed set. The funny thing about loafers is that the boys and the girls wore exactly the same shoes. For many girls this experience of wearing flat comfortable shoes would have an effect on their later habits and make the future high-heeled shoes feel very restrictive and awkward. These flat boys’ shoes were just so comfortable and easy to wear. Loafers were comfortable, and they took off in a big way in the 1970s. They were not boots and today many people forget that skinheads did not always wear the DM boots but often these comfortable flat shoes. Loafers were popular with kids of both sexes and they are still popular all these decades later.